Addie saw her first movie in a movie theater this weekend. 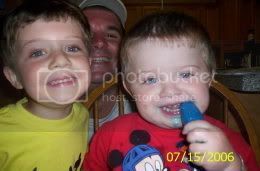 We went to see Enchanted with Grandma, Auntie Syren and Auntie Rachel. Addie was thrilled to be there. I talked it up beforehand so she'd be properly impressed with the sheer size of the screen. When she got there and saw grandma and auntie she said, "I can't believe I'm really here." Her eyes did not leave the screen the entire time! She ate almost all of Auntie's popcorn. She loved it! 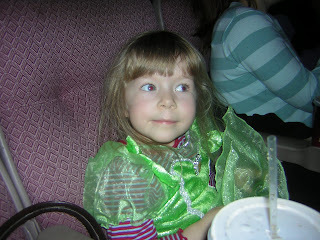 The Tinkerbell dress she was wearing over her clothes was a huge hit with all the big girls at the theater. She got several admiring glances from 20-somethings. The only problem (other than convincing her it was really time to leave the theater) was when the mean witch became a dragon. That was a little scary. But she sat on Grandma's lap and covered her eyes through most of it. I love the Tinkerbell dress! How cute is she? "I can't believe I'm really here" How adorable is that?